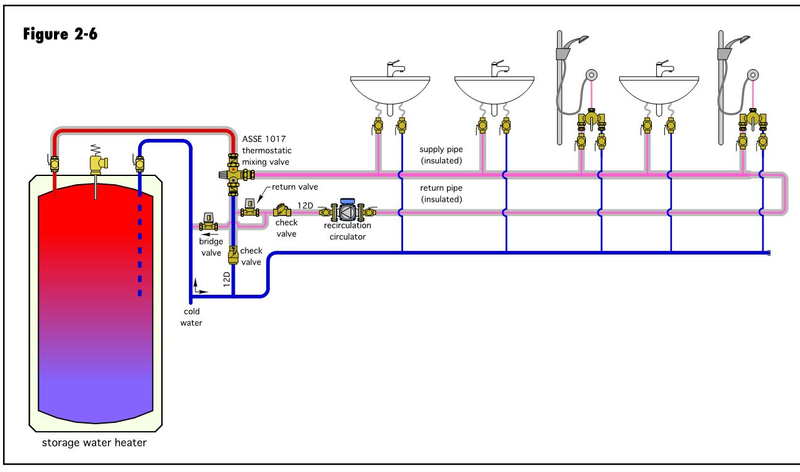 This is the installation diagram that came with a Lochinvar Noble unit. Seems to me that the check valve and return valve are reversed. Also, shouldn't the bypass valve tie in down stream of the CW line to the mixing valve. Just looking for folks to confirm my suspicion. Idronics has this diagram for a storage tank. Would it be any different for an instantaneous? Are you in an area where thermostatic mix valves are code required on all DHW supply devices? The tankless concept came to the US from markets where recirculation is not common or even needed in most cases. The intent with tankless was to mount them close to the demand. Use multiple units for large applications that require high gpm, or long distances. In the US long piping loops are common with the type of buildings we design, large and sprawling I believe some Energy Codes now require recirculation if the DHW piping loop exceeds 50'. As a result when you look for answers for how to properly use recirc, tankless and mix valves not much test data or case studies exists from manufacturers, that I can find. Same when you call their tech support lines for guidence. Currently under development is a new ASSE 1084, 1085 standard that would allow tankless WH to be installed without mix valves. 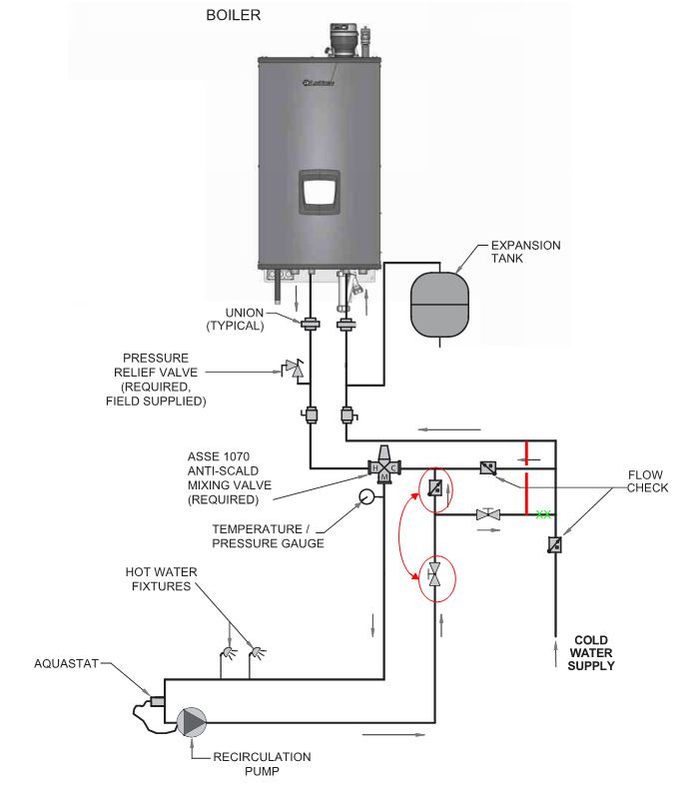 The tankless industry feels the controls onboard can regulate output temperature as, or more accurately than a thermostatic type mixing valve. I believe that is possible as it really seems to be an electronic mixing device in itself. One tip from the installers required to use mixers on ALL installations, they tell me install the mixer with a few feet of piping from the HW outlet to get the best results. IF you need a mixer, consider one that has been engineered to be accurate and lessen or eliminate the droop or creep conditions that recirc lines expose mixing valves to. The 520 series from Caleffi, for one option, has near 100% shutoff on the hot port to eliminate some of the recirc issues. Also keep an eye on Cv with thermostatic mix valves, you can see some substantial pressure drop at high gpm flow rates. This is a combi unit and unfortunately, the mixing valve is required. I'm using a Caleffi 521519AC mixing valve. Any comment on the flow diagram. Should I follow the idronics? The Idronics schematic is based on the experience of Julius Ballanco an engineer friend involved in forensic work and sits on numerous code committees. It appears in many of the manufacturers suggested piping diagrams if you look around. I'll see if I still have Julius article that describes the function of the components. The 521 is a fine valve, one of the most prevalent worldwide. The 520 is a bit more accurate and the 45 profile a bit more user friendly to tank mixer assemblies. That bypass or bridge valve should be a globe or balance valve to provide accurate adjustment. The goal of all that piping is to assure the recirc loop gets just enough flow to offset the heat loss in the piping and assure temperature at the most remote fixture. any addition record flow goes back to the heater. Balance away temperature creep or temperature droop. At days end a DHW recirculation piping circuit is a hydronic heating loop:) Insulate well to keep loss and operating cost low. The same energy code noted above requires 1" insulation. Where's you wallet. Hello, Just recently had a Lochinvar Noble installed with a recert pump for DW and the whole room re-piped following Lochinvar's diagram. The recert is not working as it should and was wondering if you found a solution?